No Is A very good message fuels this fine film. Out of Chile comes a film that was nominated for a 2013 Oscar called "NO". It's a true story political drama that pits citizens against a tyrannical government. The film makes a statement that no matter what the barrier you can fight for your rights and with the right campaign you can take it all the way to the top. Filmed documentary style the drama centers on the 1988 Chilean Government, specifically military dictator and leader of the Popular Unity coalition of Socialists and Communists Augusto Pinochet who due to international pressure has to be reconfirmed as Chile's leader for eight more years. The vote will be either a Yes or NO on the ballot with every legal voter open to the vote. Not overly concerned Pinochet has Lucho Guzman (Alfredo Castro) the best media relations guy available on his advisory board. The opposition however interviews for their campaign strategist and comes up with a newcomer, Rene Saavedra (Gael Garcia Bernal) who wins over the leaders of the group. When he comes up with an upbeat campaign however, the 17 political party coalition starts to get cold feet. The docudrama style works here with a good story based on true facts that turned a country around after years under a socialist dictator that skimmed a fortune from Chile and ordered the murder of thousands of his opposition during the 18 years he was in office. Under the keen eye of director Pablo Larrain, the story gets spooled out with a lot of energy and heated conflicts showing the tough battle that ensued between the current government and a rag tag team of opinion makers. He shows how the team doesn't give up under the worst of circumstances including threats on their lives. 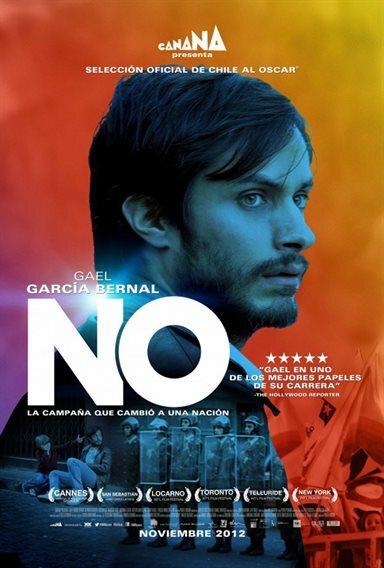 In the role of advertising executive Rene Saavedra, Gael Garcia Bernal (The Motorcycle Diaries) puts on a great show convincing the opposition made up of 17 political parties to turn the campaign of saying ‘NO' into an upbeat word that means positive change. His opposing campaign leader is his current boss, so Saavedra has to be careful that at the end of the fight, he'll still have a job. Bernal does an excellent job of showing the pressure cooker that has consumed him. The film was nominated for a Best Foreign Film Oscar at the 2013 Academy Awards and went up against some stiff opposition. Although it did not win, it may have been a close contender due to the content and the message that the will of the people can overcome even the most abhorrent of dictators. "NO" has been rated R by the MPAA for language. The film is presented in the Spanish language with English subtitles. The only downside here is the speed at which Spanish people talk, so the subtitles fly by at a pretty good clip. The actor's gestures however, do help to get the meaning across. Download No from the iTunes Store in Digial HD. For more information about No visit the FlickDirect Movie Database.